It seems almost certain now that the number of Welshman ever to have played Olympic football for Great Britain will double or treble this summer – from two in total at present since 1908 to five, six or even seven. The Welsh have been the worst represented of the Home Nations in all the previous incarnations of the GB side. The only Olympic Games where Welsh players have ever played was in 1948, when three Welshmen were among the squad of 22 chosen by a panel of selectors for Manchester United manager Matt Busby to oversee. And only two of them, Gwyn Manning and Frankie Donovan, got a game. That pair (pictured right, with Manning on the left) remain the only Welshman ever to play football at a Games for Britain. Though Wales’s Grenville Millington was on the bench for Great Britain’s last football match – a 5-0 thrashing by Bulgaria in Sofia in a failed qualifying campaign for the 1972 Olympics – the teenaged keeper from Rhyl did not play. For this summer’s Games it is now widely expected that Stuart Pearce will select United’s Ryan Giggs as one of his overage players, with Tottenham’s Gareth Bale, 22 and Arsenal’s Aaron Ramsey, 21, also highly likely to be in the 18-man squad. In addition to that trio it is now known Pearce is seriously considering adding the Swansea City duo, midfielder Joe Allen, 22, and defender Neil Taylor, 23. It remains possible but less likely that a second Welsh overage player, Craig Bellamy, could also get a call-up. Suddenly Wales is on the brink of moving from the fringe Celtic nation in the muddled history of the Team GB set-up to being the country at its core. Pearce’s Team GB will start out in Group A at this summer’s Games against Senegal, the UAE and Uruguay. Their first match will be at Old Trafford on 26 July against Senegal, followed by a game at Wembley against the UAE on 29 July, followed by a game in Wales against Uruguay at the Millennium Stadium on 1 August. Tickets for that final group game in Cardiff will surely be boosted by the prospect of seeing multiple Welshmen involved, even though many supporters and even the Welsh manager, Chris Coleman, are united with the FA of Wales in being against Team GB in principle. Our graphic below shows a potted history of Great Britain’s men’s team at the Olympics. 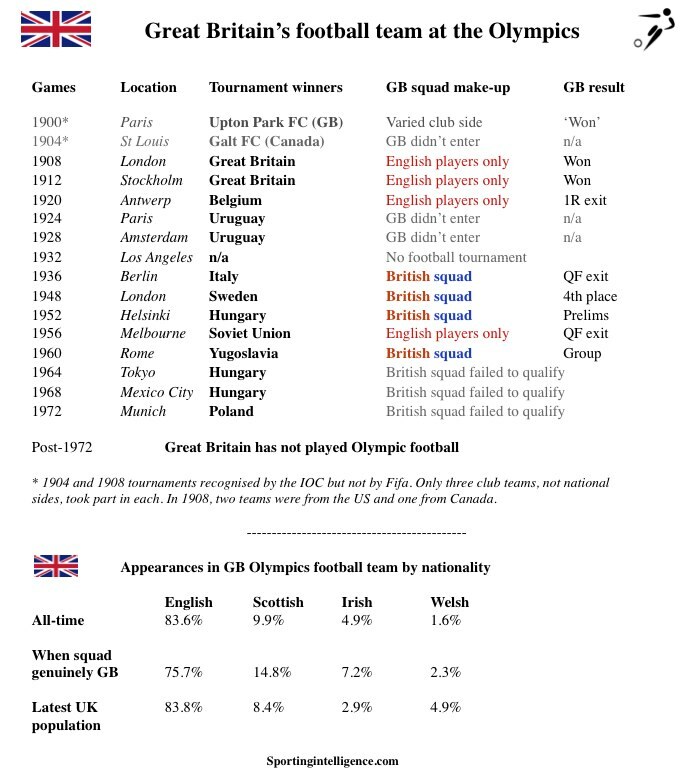 Excluding the ‘tournaments’ of 1900 and 1904, which involved only three teams each, and all of those were club sides, GB has been involved in 11 Olympic football cycles. (Article continues below). The last time that GB successfully qualified, for the 1960 Games in Rome, there were a dozen Englishmen in the squad, four Scots and three Northern Irishmen, but no Welshmen. Those Games were one of only four finals where players from all four Home Nations were considered for selection. The first occasion was the squad for the 1936 Games but neither of the Welshmen that went to Berlin played in either of the two fixtures. 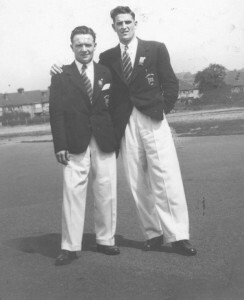 The 1948 Games featured Welshman Manning and Donovan. For the 1952 Games in Helsinki, Welshman Idwal Robling was part of Walter Winterbottom’s squad but the manager’s starting XI for the team’s only game – an abject 5-3 thrashing from Luxembourg in the preliminary round – featured 10 Englishman and one Scot, Tommy Stewart. 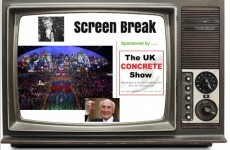 The 1956 Olympics were staged in November and only Englishmen went to Melbourne. To be eligible for the Olympics in that era, players had to be amateurs and Dave Roberts of Tooting & Mitcham (and Wales) did feature in a qualifier for the 1960 Olympics against the Republic of Ireland, when compatriot Murray Crook of Milford United was also an unused substitute, but neither featured again. After the Rome Olympics the GB side never qualified either before finally being wound-up in the 1970s after the distinction between amateurs and professionals in Britain was scrapped, leaving GB unable to enter. Overall, Britain entered teams in the Olympic football tournament on 11 occasions over a period of 64 years, starting in 1908. A total of 150 different players from all four Home Nations featured in those games in the finals and qualifying matches, which GB were involved with from 1956 until the side’s last game in 1971. 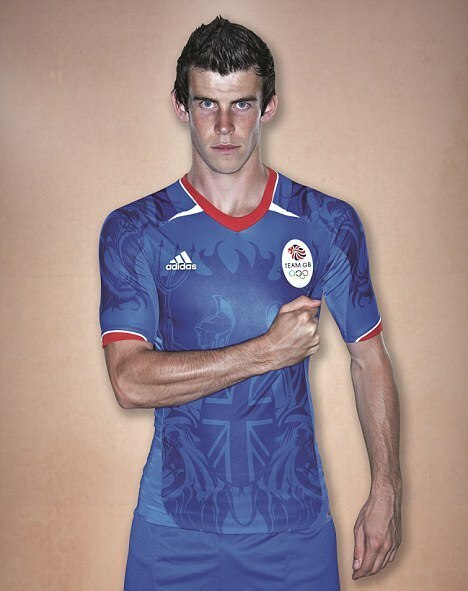 Bale of Wales and GB? Data on appearances of players that started competitive matches during the life of the team shows a clear bias towards English players, who occupied 83.6 per cent of all available starting places. According to Office of National Statistics (ONS) data, the percentage of people classified as English never rose above 82.2 per cent during this period so the British Olympic football team was reasonably representative of the population of the United Kingdom of Great Britain and Northern Ireland (Ireland in the first three Olympics). However, strip out data for the four Olympics where Irish, Scots or Welsh players were not considered (1908, 1912, 1920 and 1956) and a very different picture emerges. This shows that the Scots and Northern Irish had a greater representation in the side than either of their populations warranted. In the seven Olympic football tournaments where Scots were available for selection for GB between 1936 and 1972, a total of 263 starting places were available in finals matches and qualifying games, and 38 were taken by Scotsmen. In percentage terms, this is 14.4 per cent but ONS data show the proportion of people classified as Scottish within the UK in this period never exceeded 11.5 per cent and was as low as 9.9 per cent in the late 1960s and early 1970s. During this period, the population in Northern Ireland ranged between 2.8 per cent and 3.1 per cent of the overall UK population yet 19 starting places in the Olympic XI were secured by Northern Irish players, which is 7.2 per cent. Between 1908 and 1960, a total of 155 places were available in Olympic football squads. 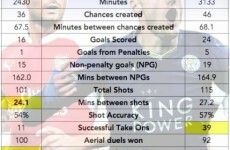 Data for this period again shows that English players dominate, taking 122 of these places – or 78.7 per cent. However, a very different picture again emerges when stripping out the four tournaments when the selection of the squad was restricted to solely English players. Of 83 squad places between 1936 and 1960, but excluding 1956. some 50 places went to Englishmen but 19 went to Scots’ players, which is 22.9 per cent of the total. At no time from 1936 to 1960 did Scotland’s population represent more than 11.5 per cent of the UK, so average Scottish representation in the Olympic football squads is double that of the country’s population. Between 1936 and 1960, ONS statistics show that Northern Ireland’s population ranged between 2.8 per cent and 3.1 per cent of the UK total, but 9.7 per cent of the GB squad in this period were Northern Irish. A committee of selectors chose squads up to the GB team’s last appearance in Rome in 1960 and also the side’s starting line-ups until Charles Hughes took over as manager in 1963. After the British Olympic football team’s last finals appearance in 1960, a handful of players from Scotland, Wales and Northern Ireland were still involved. There was little enthusiasm from their own associations, who had little interest in neutering their own independence on the world, but no direct opposition to players taking part from either administrators or fans. The Scottish FA (SFA) did influence the GB line-up back in Berlin in 1936. Four of the five Scottish players in the squad were from leading Scottish amateur side Queen’s Park FC, which was then playing in the Scottish First Division. Traveling to Berlin meant that the Queen’s Park contingent would miss a league game, and the SFA only consented provided all four of the club’s players were selected for the first round match with China. After a desultory 2-0 win over China, two of the Scots were dropped. In 1948, seven Scots were included in Busby’s squad by the selectors and the four Home Nations associations even agreed to split the cost of the GB on a per-player ratio, costing the Scots £1,597. This enthusiasm soon faded. By the time of the 1968 Olympics qualifiers, the FAW were not willing to contribute financially and the Irish FA did not even bother nominating any players. The SFA still bore some of the cost and provided one selector on a four-man panel that recommended players and was otherwise made up of Englishmen, but club interests again prevailed. GB manager Charles Hughes made the then unheard of suggestion of asking his players to miss a club game ahead of an important qualifier. The English clubs acquiesced, but not the Scots. As a result, the SFA withdrew their sole selector from the Home Nations Olympic Committee, which ceased to function. In 1969, the newly formed Sports Council convened a meeting to reconstitute the old Home Nations Olympic football committee with the democratic ideal of one member holding one vote. When the committee met in 1971 in the run-up to the Munich qualifiers with Bulgaria, the Scots did not even turn up. For the team’s final two games, one Scotsman from Albion Rovers played with 10 Englishmen in the first leg, when there was also a Northern Irishman left warming the bench. Of 16 players to travel to Sofia for the team’s last match, the only non-Englishman was Millington. In communist Bulgaria in 1971, there were no professionals; everyone was supposedly amateur even if their state jobs allowed them to do little but play sport. Nine of the Bulgarian squad that travelled to London in 1971 for the first leg of their Olympic qualifier with Britain had been at the previous year’s World Cup finals with Bulgaria, whereas Hughes was restricted to selecting most of his squad from England’s Isthmian and Northern Leagues. GB surprisingly won 1-0 at a near deserted Wembley but were thrashed 5-0 in the return. The amateur distinction was abandoned in 1974 and all English players were declared simply players, leaving the English, who had traditionally driven the GB team since its earliest days, unable to enter a competition that was still nominally amateur. Over the next decade, the Scots, Welsh and Northern Irish all reached the finals of a World Cup or the last eight of a European Championship, and the notion of a united GB became irrelevant – until now. For this summer, International Olympic Committee rules ask for an 18-man squad with 15 players aged under-23 or less and the remaining places taken by players above this age limit. Using current population numbers, a gradual shift in demographics towards England means that 83.8 per cent of the squad would need to be English, which translates into 15 players for England with Wales and Northern Ireland not even eligible to a player each. Wales will kick that idea into touch. Steve Menary is the author of ‘GB United? 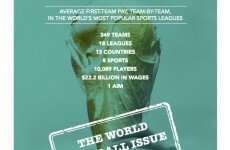 British Olympic Football and the End of the Amateur Dream‘. (Pitch Publishing, 2010).